Northern Lights shimmer in the night sky! 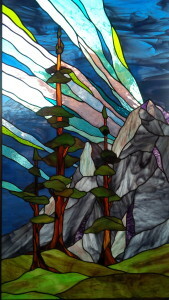 This beautiful Northern Lights window was crafted by Peter Galway at Breslau Art Glass. The blues, greens and dashes of yellow shimmer across the navy night sky and light up the mountains and valley below. This panel measures 24″ X 36″ . Design by Glassmith Studios. 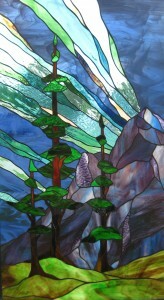 Let us make a custom stained glass art piece for your home or cottage!